The source of the Fleet were two springs at Hampstead Heath separated by Parliament Hill– one on the western side near Hampstead and one on the eastern side in the grounds of Kenwood House. Each spring feeds a line of ponds on either side (the Hampstead Ponds to the west and Highgate Ponds to the east). They were built as resevoirs in the 1700’s. 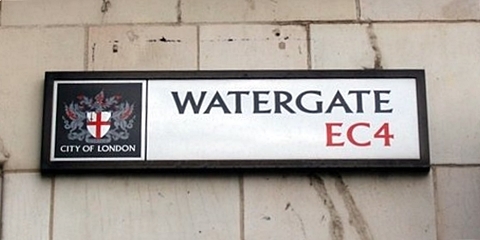 These sources joined together in Camden Town and flow under Kings Cross. From here the Fleet flows down the valley of Farringdon Street, finally falling into the Thames beneath Blackfriars Bridge. 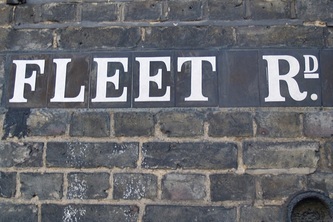 The River Fleet is the most well known of London’s subterranean rivers and is known to be used in Roman times as a major river with a tide mill in its estuary. 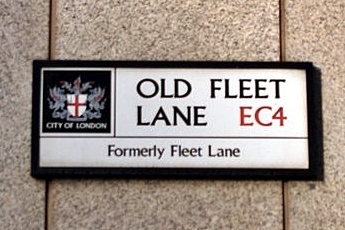 The word "Fleet" is derived from an old Anglo-Saxon word flēot meaning "estuary, bay or inlet". The Fleet once was a broad tidal basin several hundred feet wide. The higher reaches of the rivers flow were known as the Holbourne (or Oldbourne), from the word Holburna (from where the name Holborn was derived from) meaning hollow stream, referring to its deep valley. A large iron bridge called The Holborn Viaduct ,opened by Queen Victoria in 1840, spans what is known as the Fleet Valley. King's Cross was originally named Battle Bridge, referring to an ancient bridge over The Fleet where Queen Boudicca’s army is said to have fought an important battle against the Romans in 60 AD and 80,000 Britons are said to have been slaughtered here. Rumours are that Boudicca is buried undeneath a platform of Kings Cross railway station which is perhaps, no more than an urban myth…. The Fleet ran beside St Pancras Old Church nearby to the present day railway station of the same name. It was one of Europe’s most ancient sites of Christian worship possibly dating back to the early 4th century. The present church building has been here since the 11th or 12th Century. A board on the entrance railings the Church show a drawing of bathers in the Fleet in 1827. During 1865 an architect called Thomas Hardy, who later became famous as a novelist and poet, was overseeing the careful removal of bodies and tombs from part of the churchyard on which the Midland Railway line was being built. The headstones around this Ash Tree in the remainder of St Pancras Churchyard were placed by Hardy as part of that project and still exists in the churchyard to this day. Dead Cats and Turnip-Tops come tumbling down the Flood"
Aside from the tales of pollution a more positive aspect of the Fleet is that a large number of wells were built along the banks of the Fleet and reputed to have healing qualities. These included Chalybeate Wells, St Chads, Clerks Well & Bagnigge Wells. As a result, the Fleet was often nicknamed the “River of Wells” with some of these wells surviving until the 19th century. Following the Great Fire of London in 1666, extensive building work took place including St Paul's Cathedral by Christopher Wren. He went on to convert the lower reach of the Fleet into what was then known as the New Canal based on the elaborate Grand Canal in Venice. 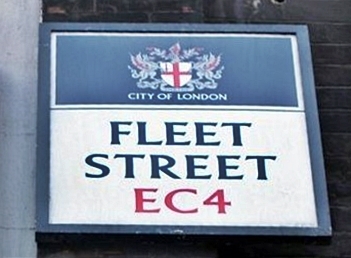 The mouth of the Fleet was broadened to a width of forty feet and flanked with great wharfs for unloading coal and traversed by four new decorative bridges, at Bridewell, Fleet Street, Fleet Lane, and Holborn. The torrent of pollution from upriver, which was still basically an open sewer, caused the canal to be a failure. It became choked with mud and was no longer navigable. Several people had fallen in and been suffocated in the mud resulting in sections being covered over from 1732. The development of the Regents Canal covered the river in King's Cross and Camden from 1812. The construction of the Metropolitan line in 1862 railway buried the Fleet along Farringdon Road although the river created problems later that year when the sewer burst causing a large section of the arches lining the tunnel to collapse. Over a hundred years later It almost gave its name to a tube line, but since its opening coincided with the Queen’s silver jubilee in 1977, the Fleet Line was named the Jubilee Line. The final upper section of the river was covered when Hampstead was expanded in the 1870s. The Fleet now exists as a large underground sewer. Have just stumbled across your facinating article on the Fleet River. For many years I worked for British Rail Research and for a time had shared responsibilty for the security of the huge hoard of artwork and artifacts owned as investments by the Railway Pension Fund. This was stored in the basement of St Pancras hotel (then unused) in a specially constructed vault. The river Fleet flowed right past this room in a large cast iron pipe which had a drain access. One night in the 1980's this pipe overflowed and flooded the basement. I remember franically lifting priceless articles off the floor onto racks as the water seeped in and the London Fire Brigade pumped out the basement (all in total secrecy!). Before St Pancras station was redeveloped there was a small passage to the Underground from the corner near the Booking Office. It was very odd because it sloped down and then up again. This was because the Fleet River pipe actually ran above this passageway. I assume the course of the river was totally altered when the station was redeveloped. "Just came across your website having read an article about hidden rivers on the BBC news website - I thought I would let you know that I used to go to school at the City of London School for Girls, which was then located in Carmelite Street, near Blackfriars. We had a large gym, and I remember one of the teachers once opening a door, taking me and some other girls through a passageway and then to another door, which she unlocked. Behind this door, we could see water flowing past - the teacher told us this was the River Fleet. I don't know if it is still accessible from the building - the school moved to the Barbican in 1969 and I don't know what the building is now used for, if it is used at all. Anyway, it was a fascinating look at a piece of London's history flowing past!"